"There were no violins or warning bells when I pulled the janitor's theme off the top of the stack and set it before me, no sense that my little life was about to change. But we never know, do we? Life turns on a dime." This mini-series contains language as well as occasional violence and mild adult content that may be unsuitable for some viewers. It is rated TV-MA. November twenty-second nineteen sixty-three: the day John F. Kennedy was assassinated and a pivotal point in United States history. Many have debated what would be different about the world today if the President hadn't been murdered. Some refer to this as The End of Innocence theory, claiming that a longer Kennedy presidency may have prevented some of the more unsavory aspects of recent American History from taking place. However, some claim the opposite. Both the novel, 11/22/63, and the mini-series adaptation, 11.22.63, are tied to this concept. They center on a man named Jake Epping, who travels to a fixed point in the past (1960 in the show, but 1958 in the book) to take actions that prevent JFK's death. Why would a High-School English teacher suddenly feel the need to work toward saving JFK's life? What exactly else does he hope to prevent by chnging events before his existence? Speculative fiction that toys with alternate history is my favorite to read; naturally, this caught my attention. Stephen King has been a household name for as long as I can remember. I have only just recently become familiar with his written works; in fact, I am still reading the book this series is based on. However, many who's opinions I hold in high esteem claim 11/22/63 as their favorite of King's novels. I have been a fan of J.J. Abrams since the first season of LOST. His career exploded with the success of his many other adaptations of already beloved works and franchise. These have satisfied the Comic Book Guys of the world as well as more discriminating fans. This is a wonderful adaptation but I couldn't help making this reference. Considering public knowledge of King and Abrams, this miniseries has quite a bit of a reputation to live up to. For me, it has more than done so. 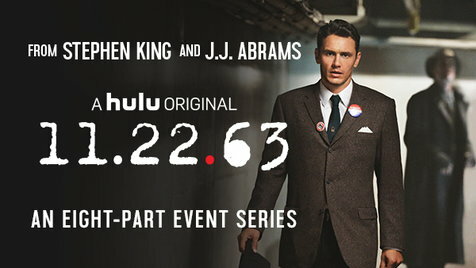 The only drawback is that 11.22.63 is a Hulu exclusive mini-series and only three out of eight episodes have come out so far. If you're looking for a reason to get a Hulu Plus subscription, this may just be it. Episodes are released on Mondays and will be until the finale on April 4th. I'm quite liking this trend in television to be honest; it's nice to be able to watch something on my time but still have the suspense of staggered release. In the words of my boyfriend, "It's purdy." Seriously, the work they did to make everything pop had to have caused quite a few migraines. The cuts are artistically carried out, the order of scene and flashback are logical, and it is just plain appealing. 11.22.63 somehow looks modern and vintage at the same time, which is where my next point comes in. In writing 11/22/63, Stephen King went above and beyond researching historical accuracy for the references made throughout the novel. It seems as if his involvement in the miniseries has helped carry over the painstaking attention from book to film. It grounds the viewer by having a character that had lived during the early 1960's explain certain societal rules and customs to Jake before he travels through time. The viewer is greeted with familiarity but is a bit alienated by how different things really were in the year 1960. Jake is the viewer's entry point to this time and place helping the viewer feel at ease with his early blunders as he adjusts to life in another time. The costumes and soundtrack are also pretty darn close to perfect if not so. I'm glad to see that they didn't feel the need to modernize this portrayal of the past and instead let the interest come from the story itself. Do I need to reiterate this? J.J. Abrams has been on a roll lately, and Stephen King is actually getting a say in a lot of this project. This means that the source material is in agreement with the adaptation for the most part. Of course there have been changes for the sake of storytelling, but having the original author's input on it has helped keep 11.22.63 true to the spirit of the novel. A lot of other super talented people are in on this project and it really shows just how much everyone involved is committed to good storytelling. I heard James Franco was the lead in 11.22.63 and thought to myself, "Eh, I'll probably watch it." Then I realized just how strategic of a move casting him was. I'd forgotten how versatile of an actor he is. There are a lot of familiar faces spread through the cast, but I didn't really notice. That's not to say that they did an unremarkable job in their roles; it's just that each actor melts into their character enough that I (for once) wasn't focused on who they are outside of the mini-series. From what I'm told, even the characters that I haven't gotten to in the book yet are still fabulously cast. 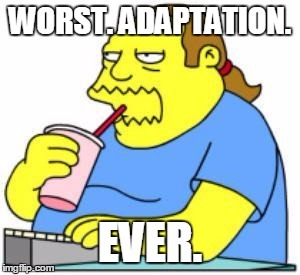 Here's the thing about well done adaptations of books that get good reception: they create more adaptation. I've heard rumor of more mini-series events with Stephen King's direct involvement. Imagine more books getting adapted to film the way authors actually want them to be adapted. Wouldn't it be grand? That sort of thing happens when projects like these get support. Releasing this on Hulu says something as well, culture is shifting away from cable. Artistic individuals are realizing the freedom that streaming services provide, not only for their choices of expression but for the viewers. It seems a lot more logical to release something that can be viewed at any given time after it streams than to assume your target demographic has time to drop everything they're doing during a specific hour once a week. Benchwarmers said it this way, "If you build it, nerds will come." It's time we embrace our power as consumers and show them we're ready to play but on our terms. In any case, here's a trailer for the undecided. Have you watched 11.22.63 yet? Have you read the novel? How do you feel about this adaptation? What are your opinions on this potential new era of television and adaptations in general?